If you hadn’t noticed already, blogging is one of my favorite subjects (and activities). There are many wonderful benefits to writing engaging and informative articles online, and it’s a great way to connect with your audience besides. Of course, I’m passionate about writing, and you may not be. That’s okay; you don’t have to love it to do it or to enjoy its benefits. If it isn’t your cup of tea, I’m not here to judge. However, your mind might be changed by the time you go through the resources I’ve curated below. In the online world, textual content is paramount; especially if you want to be discovered by search (Google, Yahoo, Bing, etc.). Audio and video are powerful mediums, and I would never discourage anyone from creating more media-based content, but we have to keep in mind that search engines crawl for text; they don’t know how to read images, podcasts or videos, as great as these forms of content are! So, whether you’re trying to increase your search traffic, keep the content on your site fresh, or deepen your connection with your fans, blogging is a great way to accomplish that goal. In this post, I’m going to provide you with a variety of resources you can access to learn more about blogging. From tips and resources to strategy and mindset, you will find a variety of content that you can study and learn from. Also note; I will be updating this post as I create and find more resources that add value to the conversation. I’m also playing with the format of this post; it may not be perfect, but I’m working on it. Where Can I Set Up a Free Blog? : if you’re not sure whether or not you want to commit to building your own website, or if you just want to give blogging a try, this post will point you in the right direction. The Basics of Blogging Success: this Salesforce post covers the basics of blogging success. From finding a topic that addresses a pain point to the importance consistency, there are many fantastic tips within this post. SEO for Idiots: The 10 Basics of Blogging Search Engine Optimization: if you aren’t familiar with SEO, what it is or how it works, it would be a good idea to learn more about it, as SEO is a very relevant component of blogging. This guide should prove enlightening. 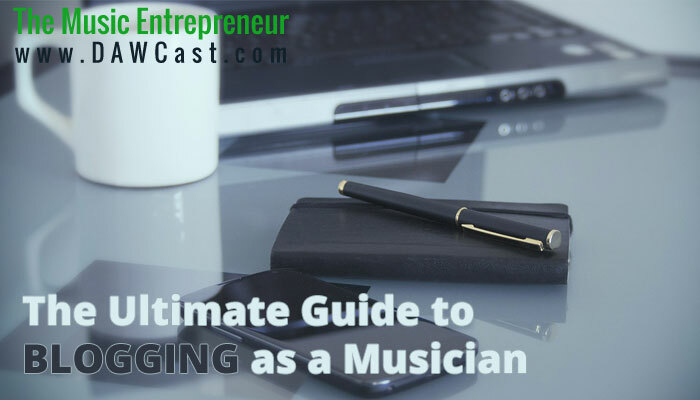 You can also take a listen to this podcast episode entitled Back to Basics: Blogging, which will give you a general overview of blogging as a musician. How common blogging practices have changed over time. How to create content that can be discovered in search. Why frequent engagement is so important. How blogging can open doors to new opportunities. What topics to blog about as a musician. Another podcast episode that talks about the basics of blogging is Back to Basics: Guest Blogging. This audio discusses how guest blogging can help you to grow your audience. Why old guest blogging tactics are no longer working. How guest blogging can still be effective if done the right way. How to create content that will add value to blog owners. How guest blogging can benefit you. I also have a podcast episode that discusses the basics of Search Engine Optimization or SEO. Why SEO has a bit of a bad reputation. What musicians should know about SEO. What musicians should know about keywords. How blogging can help your SEO. Corey Koehler and I discussed the importance of blogging on the MusicGoat Fan Finder Podcast. Our topic of discourse was: Why Bands and Musicians Should Have a Blog. I would recommend listening to this audio if you’re still not sure why an artist might want to blog. Why musicians and bands should have a blog. How musicians and bands benefit from their blogging efforts. How to generate search traffic from your blog. How to engage your audience and build relationships with them. How to connect with different types of readers. Why search engines like blogs. How to entice readers to click on your content by using strategic keywords. How to turn your passions into topics for your blog. Why developing consistency with your blogging efforts is so important. How to craft titles that grab people’s attention. How a local focus could drive traffic to your website. How you can appeal to different visitors with different types of blog content. Post Length has nothing to do with it: bloggers used to engage their audiences with frequent, shorter posts. However, many of them are finding that their audience prefers detailed, in-depth articles again. Ultimately, the lengths of your posts all depends on your blogging goals and your audience. Is it Possible to Write Off-Topic Blog Posts as a Musician? : at the end of the day, you can write about whatever you want, even as a musician. However, it may be worthwhile to create a plan, set some goals, and get your blogging strategy in-line with your objectives. How to Develop a Workflow for Your Blogging Efforts: in this post, I explore Darren Rowse’s blog post workflow, and how having a concrete routine can help you produce more quality content in less time. 4 Places to Find Free Images for Your Blog: there are definitely more than four sites where you can find free images for your blog, but this post provides a few jumping-off points for you. 55 Ways to Increase Traffic to Your Music Blog: The Definitive Guide – we wanted to put a cap on the subject of traffic, and decided to put together our own in-depth guide. It’s completely free, and can be read here online. 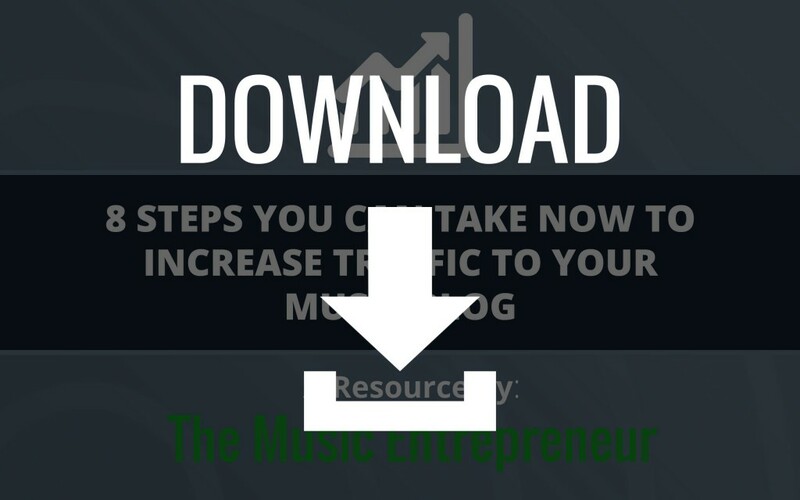 8 Steps You Can Take Now to Increase Traffic to Your Music Blog – this is a nicely formatted guide that expands on the points discussed in the How do I Increase Traffic to a Music Blog? post. It’s worth every penny, and it only costs 99 of them. How do I Increase Traffic to a Music Blog? : traffic generation is a huge topic among bloggers. Though quality of traffic is always more important than quantity, you still need to know how to market your blog successfully. In this video, Smart Passive Income‘s Pat Flynn explains the strategies he uses to engage his audience. If you want to develop a real connection with your readers, this is definitely worth watching. Blogging Tips for Musicians: this is the most in-depth post I’ve written on the subject of blogging as a musician. In fact, it may be the most detailed post on this topic online. It’s not for the faint of heart, but if you’re serious about blogging, this guide should provide you with many ideas to explore. Is blogging your ticket to speedy full-time musician status? : when you think of becoming a full-time musician, guest blogging probably isn’t the first strategy that crosses your mind. However, this post by Ben Sword is absolutely fantastic and is definitely worth a read.